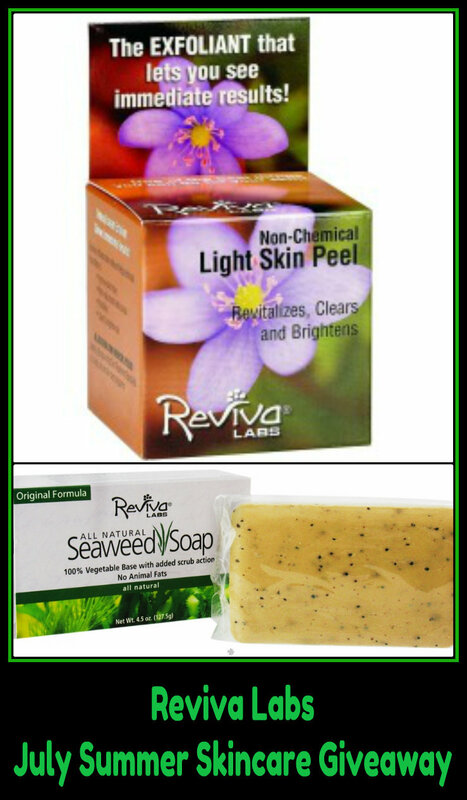 Reviva Labs is hosting their Summer Skin Care Giveaways on a number of blogs all Summer long, and July's giveaway features their Light Skin Peel and Seaweed Soap. Both of these products are great for exfoliating your skin during the Summer months. Below are some words of advice on the benefits and importance of exfoliation from Mr. Strassler, the President and Founder of Reviva Labs. He also discusses the use of the Light Skin Peel. • Dead skin cells that accumulate on the skin surface dull the complexion; keep skin tone from looking fresh. Each week you have dead cell build-up, dulling and clouding the skin, depriving it of its smoothest texture. • Besides dulling skin tone, when a sufficient amount of dead cells aren’t removed, other harmful effects can occur. Bacteria, dust and toxins can accumulate within … pores can get congested and block normal oil flow to the surface, causing blemishes. • Dead cells obstruct treatment products from being absorbed. Even the best products can’t do their job if they’re just sitting on top of dead cells. Without exfoliation, even the best moisturizer or night cream can’t penetrate the excess cells. So exfoliation is important for every skin type … and all ages … and it is particularly vital for aging or blemished skin. Reviva was one of the very first companies to introduce the European concept of exfoliation to America in the 1970’s. Whereas exfoliants like alpha hydroxy acids take weeks to show results, Reviva’s UNDUPLICATED LIGHT SKIN PEEL EXFOLIANT immediately removes dead cells, bringing out the clear, moist new skin cells below, helping revive your complexion. If you are using alpha hydroxy acids, like glycolic acid, you can still use our Light Skin Peel once-a-week on a day that you don’t use the Glycolic Cream. In fact, the use of Light Skin Peel will speed-up the results of a glycolic program as well as shows the immediate improvement in skin texture. For dry skin, our formula invigorates new cell activity as it removes dead cells. This improves metabolism and allows new cells to arrive at the surface with more moisture, helping to alleviate dryness. For oily skin, it helps unclog pores so that there can be normal oil flow to the surface. Blemishes occur when oil gets backed up in pores, harden and can’t reach the surface. For aging skin, cell-building and circulation are inter-related. Light Skin Peel is invaluable when cells do not regenerate normally in aging skin. Cells do eliminate waste materials properly via blood circulation. Not “breathing” properly, skin cells then can create a blotchy complexion or discoloration. This would be added to the dryness problem. “Light Peel’s” effect is not abrasive. There is no harsh stretching of the skin. So it is safe for the most fragile, sensitive skin. The dead cells and waste materials are simply enclosed by the grainy liquid and removed. Your body also benefits from exfoliation, and the Seaweed Soap is filled with seaweed grains for gentle scrubbing to slough away dry skin. This vegetable-based soap of palm and coconut oil is gentle, all natural, and effective. This soap was my first introduction to Reviva Labs several years ago, and I still enjoy using it. It leaves my skin soft and smooth, and even my husband loves it. It lathers up very well, and you can really feel this bar exfoliating your skin. I've used many soaps with exfoliating beads or grains, but the Seaweed Soap is by far the best at exfoliating. All natural, no animal fat in the base, clean, fresh, smooth skin that feels moisturized. What more could you ask from a bar of soap?!! One lucky reader will be randomly selected to win July's Summer Skincare Giveaway and receive both the Light Skin Peel and the Seaweed Soap. You can find the ingredients for both of these products by clicking on their titles up in the first paragraph of this post. Reviva Labs makes only all natural products, and they never test on animals. Entry Details: If you'd like to enter for a chance to win Reviva's July Summer Skincare Giveaway, just leave your eMail in the comments section below. If you aren't comfortable leaving your eMail, please simply leave a comment and check back on Wednesday, August 1, when I announce the winner. You can then eMail your contact information to me at mej0620@hotmail.com. We have some more great Summer Skincare Giveaways from Reviva in August and September! Deadline for entries is July 31, 2012 at midnight. Note: Reviva Labs will be shipping the prizes direct, so this is only open to residents of the U.S. Followers only. I would love a chance to win these products as the ones by Reviva I have tried are great. Both the peel and soap look very interesting. Ohhhh Goodies!!! Thanks for the chance to win! I love what I've tried from RevivaLabs. Thanks so much for the giveaway! I would like to enter to win these. They look great! I would like to enter to win the Light Skin Peel and the Seaweed Soap. Reviva Labs make great products. Thank you for the contest. I'd love to win. Thanks for the opportunity! I first tried Reviva Labs thanks to you and am now obsessed! I would love to try these products. I love experimenting with new products. this would really help my skin. The light skin peel would be wonderful to try. At my age...a light skin peel would make me feel years younger! It can only improve my dull, sun stroked skin. Thanks for the opportunity! The peel sounds amazing! An all natural gentle peel that doesn't cause redness. I would love to win and so would my skin. I would love to To Reviva Skincare!